Muddy Loafers: COUNTESS ADA LOVELACE – ENCHANTRESS OF NUMBERS. COUNTESS ADA LOVELACE – ENCHANTRESS OF NUMBERS. The digital world today hardly remembers “The Mother of Computer Science” – Ada Lovelace, who wrote the first computer program in 1837, while she was still in her teens. Ada Augusta was the daughter of the poet Lord George Gordon Byron, who suffered bouts of insanity and was notorious for his erratic behaviour. He abandoned his family when Ada was only a month old, either because he felt intimidated by his highly intelligent wife Anne Isabella Milbanke, Baroness of Wentworth, or because Ada was not the ‘glorious boy’ the couple had expected. Ada was born on the 10th of December 1815, in London. She grew up under the care of her maternal grandmother Judith, Lady Milbanke. Her mother had little affection for her and distanced herself from her child. She was always afraid that Ada would show signs of insanity like her father. Though physically distanced from Ada, she made sure that her daughter got a sound education through the best of private tutors. Maths, Logic and Science were subjects that took precedence over French and Music. She kept a close watch on Ada’s progress and berated her if she didn’t do well in her studies. From an early age, Ada showed a keen interest in Maths. She also had a fascination for machines. At the age of 8 she modelled boats. At 13, she designed flying machines. But Ada was not a very healthy girl. In 1829, she was paralyzed after an attack of measles and was incapacitated for a year. She had to walk with crutches until 1832. But nothing could mask her brilliant mind. She was presented at Court when 17, and became the belle of the season because of her brilliant mind. The highlight of Ada’s life was her meeting in 1833 with Charles Babbage, a Mathematics professor at the University of Cambridge. He was called the ‘Father of Computing’ and invented the first programmable computer – The Analytical Engine. He invited mother and daughter to view a small version of this calculating machine. Ada was determined to find out how it worked and asked for the machine’s blueprints. Her enthusiasm was such that she became the world’s first computer programmer, publishing the Bernoulli Number Algorithm. 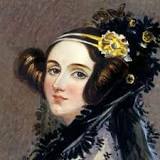 Ada was convinced that it would not just remain a calculator but would contribute to other areas like music, alphabet, images that could be converted into computer algorithms. Ada was married at the age of 19 to William King, Earl of Lovelace, and bore him three children in quick succession between 1836 -1839. But she had inherited from her father a flirtatious tendency and her affairs led to gossip among her mother’s friends. Ada was also a gambler and lost scandalous amounts on horse races. Though Ada’s mother tried to poison her mind against her truant father and showed her his photograph only when she was 20 years old, Ada secretly harboured a soft corner for Byron. On November 27th 1852, Ada died at the age of 36, from uterine cancer. According to her dying wishes, she was buried beside the grave of her father in the Church of St. Mary of Magdalene, Hucknall, Nottingham. Ada Lovelace Day commemorates her genius. It is a day when Women International celebrities in Science, Technology, Engineering and Maths (STEM) are recognized and felicitated. It was first celebrated in 2009, and is now annually observed on the 2nd Tuesday in October.